Watch the kids construct a fun time with Busy Busy Builder Dress Up Game. Players take turns trying to collect a full set of tools-but watch out, or you may end up with The Sore Thumb! Collect all the tools, and the wearable tool belt, and win the game! 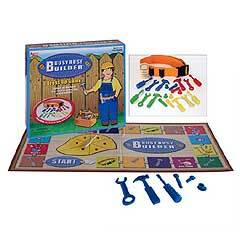 Includes game board with screwdriver spinner, tool belt, 4 hammers, 4 screwdrivers, 4 wrenches, 4 bolts, 4 nuts, 4 movers, 1 sore thumb, and instructions. For 2 to 4 players ages 3 and up.